Anyway, after my job at the firm, and after I gave birth and all. I tried working from home. I told myself this would be perfect -I could work while I could look after our daughter. But apparently my first online job was as an English tutor. It was quite an experience, but it was not the job for me because well, I had to take calls, and no one could look after my little one while I'm doing that. I then asked my college batchmate who I've seen posting about her online job - and that lead to my second online job. I applied to that one as a customer support to a Interior Design mobile app, she didn't because she already had a job at the time. After some time, both of us were working there at the same time as Design Assistants. Glad I have someone I know in the same company! Though that one didn't last long. We only have a month contract with it, but it was okay. It was worth it. It took me a looong time to find another online job. Anyway let's talk about being a work-at-home Mama. It's not really that easy, but if we will talk about the commute part, well of course it was easier since all I had to do is be on time at work even if I haven't brushed my teeth, or combed my hair, or even if I'm in my worst outfit. Lol! At least now, I could work while I'm with my little girl - and I can say it is the best part! And of course, I'm able to help my husband with our fincances! But with looking for a homebased job, unfortunately, yes there are a number of scams on the internet, especially on facebook! It was also a struggle to find a job that you sure is legit. Thankfully, I haven't encountered scams so I'm not really sure how it goes or how they would talk you through it. But I've read from forums that one of the modus would be when they ask you for some money for you to have an account with them or something like that, basta you have to pay them in order for you to get the job -and that is weird! Well, I'm not entirely sure but I haven't encountered a legit online job that would ask me for money. So just be extra careful when finding legit online jobs! 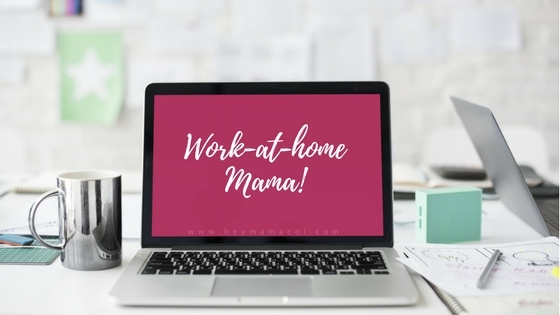 Now Mamas, let me share with you some sites that I personally have had a job from or I know have LEGIT clients. Another good thing about this site is the pay happens within the site so if you have disputes or anything like that, you could talk to people from Upwork and they'll help you. This is where I got my current job. Just be keen with their job posting, sometimes scams are already given through their job posting. Difference from Upwork is you talk directly to the client and the pay is between just the two of you. Now this is different from the previous sites I've posted. With 199Jobs, you're the one who's going to post about your service, for example, you'll design, write an article or transcribe, and the pay is 199.00Php. Yes, it's pretty low but I don't think there are scams here. The pay is through their site that you could transfer to your bank account when you reach a certain amount. I've tried this even if I was still in college. And because I was in college, I didn't really bother about this. This site, obviously from it's name, is where you write essays about any topic that you would get/choose. Not sure with how the pay works. I also tried here but didn't push through because I got my current job now as Social Media Manager. Difference from other sites is that you'll talk to people from Virtual Coworker and they'll the ones who will talk to the client. They're like an online agency if that's how you call it. Not sure with how the pay works. Basically just like Upwork. I'm not really sure with how it works on this site though. These are the sites I can share for now, but I will update this if ever I find sites I have tried or I'm sure are legit. There may be scammers on these sites so be extra careful! And if you could join groups on facebook for home based jobs, please do, but please don't trust those who asks for money for a job. I just don't think it's supposed to work that way.